Cheap Thrills - Boston: SAT 7/19 & SUN 7/20: Do Something! around the Boston area that cost $10 or less. SAT 7/19 & SUN 7/20: Do Something! There is still a lot of cheap fun this weekend. I hope you have a good time whatever you do! Send your positive vibrations as I'm DJ'ing someone's wedding tonight. Davis Square is already a cool spot to hang out on any weekend. A wonderful culture bomb of music, art, dance, food, crafts, etc. hits this weekend. Since the theme is "Green" (not exactly a fresh idea but still will be a good time), all will feel slightly more friendly to the environment. Today is full-on arts festival with streets closed for exhibits, performance stages, activity areas, and food/craft vendors. 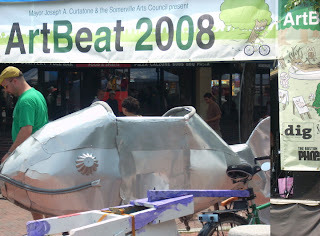 Check out the odd bikes of the "Different Spokes" exhibit like the "fish bike". Decorate your own bike & helmet. Walk or ride in the "Green Brigade Parade" at 5:15pm. Use the Bike Valet, so don't have to irritate everyone by walking your bike through the crowds! Jeez! People are practically begging you to get on the water! Go for a sail and a tour of the facilities. You don't have to sign up for anything. Note this is on the harbor, not on the Charles River. This is the final open house event of the season. This is a fundraiser for the 11:11 Theatre Co., so you could have a good time and possibly win prizes including a pair of Sox tickets for first place. Teams of two solve puzzles and explore a well-traveled patch of Cambridge. There is more info including a puzzle sample at the link. The way I understand it, a blindfolded person is guided along a chalked-out maze by a group of other people who create a moving stretch of "tunnel". It looks a bit disorienting and geeky, but it could be a lot of fun. I get the feeling that the "Life Is Good" World's Greatest Backyard Athlete Festival may not be that exciting to watch and it's more than $10 to participate. It is worth the trip to see the amazing guitar prowess of gospel-influenced rocker Robert Randolph. Funky jazz guitarist Melvin Sparks is pretty damn good as well. In between, I believe is the "finals" of the Backyard Athlete competition. A band that started out as bluegrass phenoms a few years ago have broadened their sound and slowed the tempos into something in a country-rock/Amerciana vein. Three Day Threshold went on a USO tour to Central America at the beginning of the month, so they're heroes in their own way. Salute them or just enjoy the beer selection while the alt-country is washing over you. Summer Villains will do a set before TDT takes the rest of the night. They've been working on their giant sand works all week. Should be pretty cool addition to a day at the beach. There's a fireworks display around 8pm on Saturday. Throw in a fried clam plate from Kelly's, and life will seem beautiful and carefree. On my first trip to Eastie's Italian festival, I had a terrific time. The vibe was similar to a North End street festa, but it had more room -- and there were little touches that made it feel like a neighborhood party. They still have more room than the North End, but it felt like any other Italian festival when I visited last year. Besides the usual food, carnival games, and C-level entertainment, they have some so-so kiddie rides. Worth the T trip? Sure, if you wanted to go to an Italian street festa this weekend. Get a taste of Puerto Rican and Latino culture at the oldest & biggest Latin American festival in New England (named after the 19th-century Puerto Rican humanitarian, Dr. Ramon Betances). There will be 'mucho' pan-Latin American entertainment: music, dancing, arts, crafts, food, and a grease pole contest! On Friday, the music will be traditional old-school folk music of Puerto Rico (Jibaro) and a Bolero band. Saturday is 'International Day' with sounds & styles from all over Latin America, and Venezuelan jazz flautist Huascar Barradas (6:15pm) should be a highlight. On Sunday, you'll hear various genres of Puerto Rican music. Although he's in his fifties now, headliner Ismael Miranda (6:30pm) was supposedly known as the "Pretty Boy of Salsa". The Greased Pole Contest (aka Palo Encebao) happens from 12:30pm to 2:30pm at O'Day Park. You wouldn't think that a bunch of guys clamoring over a big greasy pole in the South End could be eventful, but it is exciting to watch... This annual highlight is definitely a sight to see at least once in your life. I'm usually not hungry enough to try more than one meal, all of the food looked and smelled delicious. The annual Free Shakespeare performances are really one of the best gifts to the city, so we should appreciate it and take in a performance. It's one of the Bard's sylvan love stories, which the Commonwealth Shakespeare Company will twist it in their way as they usually do each year. From what I can tell, it looks like the sets will be reinterpreted in a 1930's/40's style. "The Real Inspector Hound" w/ "Hidden in This Picture"
There's more free open-air theatre! English Performances on Wednesdays, Thursdays, and Saturdays. "El Verdadero Inspector Sabueso" con/ "Escondido En La Imagen"
Here is your reason to go to Chelsea: two one-act plays -- by Tom Stoppard and Aaron Sorkin. Both works are comedies in English and Spanish... Take the #111 bus for an adventure in free theatre -- and who knows what else -- on the other side of the Tobin. Four more performances next week: WED 7/23 to SAT 7/26. A bunch of musicians become a tango ensemble after four days of study and rehearsal that culminates in this concert. I heard from Bernardo Monk, and this show is unfortunately canceled. Holy moley, this is a lot of gospel music at one time! Christopher Klein, "Discovering the Boston Harbor Islands: A Guide to the City's Hidden Shores"
If you didn't get on Saturday's free trip, it's only slightly more than $10 to spend Sunday out there and learn more about the Harbor Islands from author Christopher Klein. You could just walk around, relax, picnic, whatever. There will be some live music too. Take all the pieces of your web presence and meld it together in a easy-to-read interface. I consider it fulfillment of my community service to point you to this site of volunteer opportunities. "Summer is the time when one sheds one's tensions with one's clothes, and the right kind of day is jeweled balm for the battered spirit. A few of those days and you can become drunk with the belief that all's right with the world." SUN 7/27: Forecast -- Rain. Who does this guy think he is?